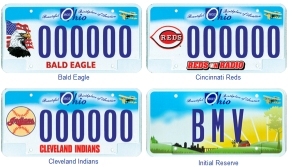 The "Beautiful Ohio" plate is not a mandatory replacement for Ohio BMV customers; it is an option for those with current registrations to replace their current plates. The cost of the plates is $7.50, in addition to other applicable fees that apply. Additional mandatory applicable fees include a $3.50 Deputy Registrar fee, $.25 county sticker fee and $.25 per plate reflectorization fee to cover costs associated with reflective sheeting on the plates. Customers interested in obtaining a new set of plates featuring the "Beautiful Ohio" design or the "Sunburst" design - the state’s designated general issue plate - will pay a total cost of $11.75. The Northfield License Bureau also has a customer terminal which can be used to determine the availability of personalized and reserved plate letter and/or number combinations. Once you have determined that your requested combination is available, it can be ordered immediately from the Northfield License Bureau. Fees vary according to the type of plate ordered. Additional plate styles can also be ordered directly from the Bureau of Motor Vehicles.